(Ottawa, ON) Wheelchair Basketball Canada congratulates members of the London 2012 gold medal winning Canadian Men’s Wheelchair Basketball Team recognized with four awards at the 2012 Canadian Wheelchair Sport Association (CWSA) Awards including Team of the Year, Male Athlete of the Year, Coach of the Year, and Athlete with Fair Play and Dedication to Excellence. “We would like to offer a heartfelt congratulations to all of this year’s CWSA Awards winners. Wheelchair Basketball Canada is certainly pleased to have representatives recognized amongst all of the outstanding individuals and groups who captivated us in 2012 with remarkable athletic performances, dedication to excellence, and collective efforts that continue to strengthen the Canadian sport community,” said Wheelchair Basketball Canada Executive Director Wendy Gittens. Doug Grant Memorial Award for Team of the Year: The Canadian Men’s Wheelchair Basketball Team received the Doug Grant Memorial Award for Team of the Year. Led by head coach Jerry Tonello, they went undefeated through eight games to claim their third gold medal in the last four Paralympic Games with a 64-58 victory over defending-champion Australia. 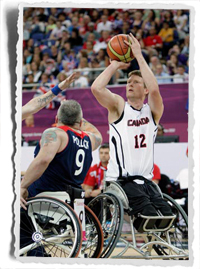 The triumph marked Canada’s fourth consecutive podium performance, as the team avenged the loss to the rival Aussies in the 2008 final, and solidified their dynasty as one of the premiere wheelchair basketball programs in the world. Male Athlete of the Year: Fergus, Ontario native Patrick Anderson was named Male Athlete of the Year for his contributions to Canada’s gold medal in London. A highly motivated and focused Anderson posted the best offensive numbers of his career including a pair of triple doubles (reaching double digits in three different offensive categories), and twice came within one rebound of accumulating two additional triple-doubles. He finished tops in tournament scoring averaging 25 point per game (200 overall points in eight games played), and first in total rebounds with 88 (11 per game). Stephan Dubuc Memorial Award for Coach of the Year: Team Canada bench boss Jerry Tonello, of Toronto, Ontario, was named recipient of the Stephan Dubuc Memorial Award for Coach of the Year. Tonello’s ability to motivate his athletes in the pursuit of sport excellence was on full display in 2012 as his team reached the pinnacle of the sport. Inside of a year, he navigated Canada from an upset third place finish at the Paralympic qualifier in November 2011 (where the team secured the final berth to London) to the top of the podium and Paralympic supremacy in September 2012. Tonello instilled a renewed commitment to physical fitness and mental focus amongst his athletes, and simultaneously created a positive environment in which team chemistry could thrive. Working tirelessly on team strategies and specialty tactics he ensured Canada was prepared to face whichever opponent it encountered along the path to the gold medal. “Jerry did an outstanding job by motivating the veteran players and working to develop the newer recruits in order to bring out the best in each athlete and ensure the overall success of the team,” said Paul Zachau, high performance director of Wheelchair Basketball Canada. Stan Stronge Award: Wonowon, BC’s Bo Hedges received the Stan Stronge Award as an Athlete who displayed Fair Play and Dedication to Excellence. 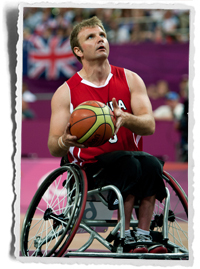 Not only was Bo Hedges crucial to the Canadian men’s wheelchair basketball team’s gold medal performance at the London 2012 Paralympics, but he also gives back to the community by volunteering as a coach, board member and athlete representative.